As you may have guessed from this weeks’ title, I’m kind of cheating. The actual post for today should have been ‘Top Ten Hidden Gems in X Genre’. But, as I have explained in the past, I am the absolute worst at discovering hidden gems. My TBR consists mostly of a huge backlist of popular books I still need to get to. I very rarely pick up a book when I have not heard about it before or have not been recommended it by my bookish friends. It’s a big shame of mine and I’m constantly working on it. Add to that the fact that I just got out of a reading slump and well, I wouldn’t be able to give you any hidden gems that I haven’t already talked about before. 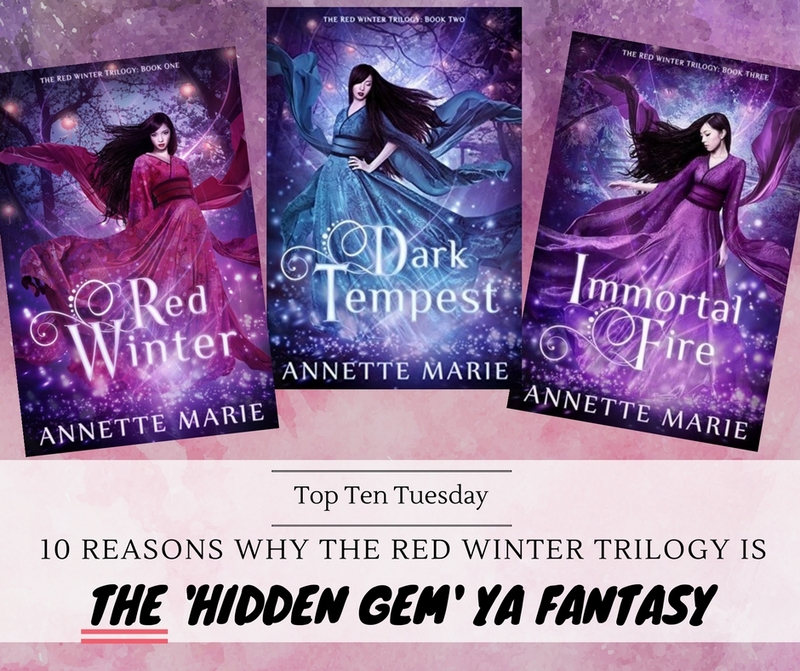 Anyway, with that said, please allow me to introduce you to the wonderful Red Winter trilogy by Annette Marie and present to you TEN reasons why it’s THE hidden gem you need on your YA fantasy lovin’ bookshelf! Maybe it’s just me, but there don’t seem to be that many Japanese mythology books out there. I mean, sure, I could read about dragons and wyverns all day long. I love paranormal creatures, but vampires and werewolves are everywhere. And most of us probably learned a thing or two about Greek mythology from Rick Riordan. But Japanese mythology? Give me more! 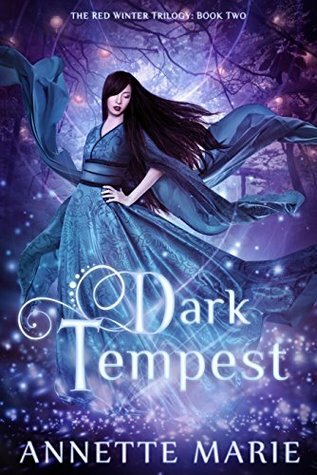 The creatures in this book are so intriguing and magical and new and lovely and you’ll be intrigued before you know it! The world in the Red Winter trilogy is so beautifully written and so much thought has gone into the development. To be fair, the first 20% or so is pretty dense. There is a lot of information to process, a lot of names to learn and it might be a little complex and intimidating at first. But please trust me, it is so worth it. Once you are completely immersed in the world, you’ll never want to leave it. Also, it does help that there is a handy glossary at the end and the ebooks even have links to images to help you visualize. It is a gorgeous, well-developed and vividly described world that I’m still not ready to say goodbye to. 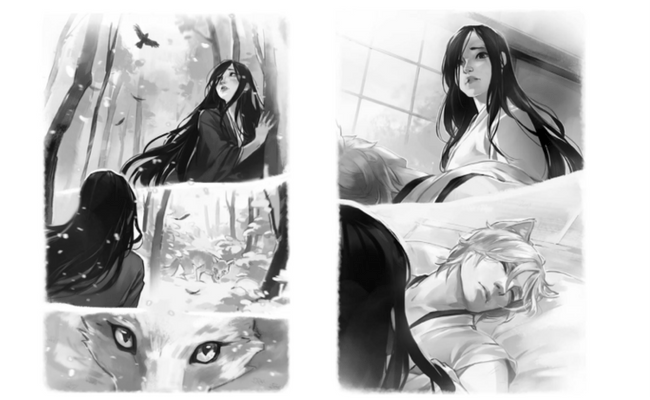 Did you know that every single book in this trilogy also includes 10 absolutely gorgeous full-page illustrations by Brittany Jackson? Not only are they heart-stoppingly beautiful, they also really help visualize the scenes and characters vividly. Our main character Emi definitely not your average fantasy heroine. When she was 8 years old, she was marked by Amaterasu, the goddess who will use Emi as a vessel to walk on earth. This moment is what Emi has been training and working her whole life towards and it is almost here. However, it means that she has been very sheltered and is lonely. She may not have great physical strength, but she is filled with so much kindness and courage and it makes her a great protagonist. In fact, she may have become one of my all-time favorite heroines ever. Her development thoughout the entire series has been amazing and I have nothing but respect for her. Her fate has pretty much been sealed from the beginning, and this heavy burden could have turned her into someone else entirely, but she has grown into an incredibly strong, brave and mature young woman. Her fears and worries are very much present and real, but she handles everything with a grace and maturity that can only be admired. Our main hero may not be your traditional hero. He’s a kitsune, a mischievous fox-spirit, who has been cursed and can’t remember anything about his past. When Emi saves him, he is in her debt and that’s really when the story takes off. He’s a great character, one who you’re not completely certain you can trust, someone who is unpredictable and cunning and mysterious and just that perfect bit of morally grey. Oh, and he’s also a big, unapologetic flirt. But what could have been a one-dimensional character turned into such a deeply layered and complex guy. Yumei is the third part of our little trio here and boy is he amazing. The stoic Prince of Shadows could have easily been another a walking, breathing stereotype, but Annette Marie fleshed him out so wonderfully and turned him into a fully fleshed-out and realistic character. It’s super intriguing to see his relationship with the other characters develop throughout the series and enjoyable to observe the contrast this stoic Prince of Shadows offered to the human, emotional Emi and the teasing, fun-loving Shiro. I never gave any thought to the term slow-burn friendship before, but this series is the perfect example of exactly that. These three characters couldn’t be any more different, and while it seems highly unlikely at first, they form a connection and grow to trust, respect and care for eachother so, so much. The friendship that has grown between all three of these characters pulled at my heartstrings throughout the entire series and I adored every single scene they had together. Okay, the first 20% or so of Red Winter is pretty information-heavy. But once past that mark, once Emi and Shiro meet, this is one huge, epic adventure with perfect pacing. It was a thrill to go on these adventures with Emi and Shiro, meet all these amazing characters and fantastical creatures and learn more about the world. It’s a whirlwind ride that’s pretty hard to put down once you started. The pacing in this series is also one of my favorites. I mean, there is so much going on, so much to do, so much action and so many epic scenes and still it is all balanced so perfectly with a few slower moments, moments of contemplation, character development and romance and I am so here for all of it! For me, this series was the perfect mix of a plot-driven AND a character-driven story. How can there still be room for romance when there is already so much worldbuilding and action going on? Well, there is and it is glorious and heart-wrenching and just the right amount and perfectly paced. Every single scene between these two characters is sizzling and so of course they will go down in history as one of my beloved OTP’s. No insta-love here, but the best slow-burn you can imagine. Also, though there are a few hints at the very beginning, no love triangle AT ALL! 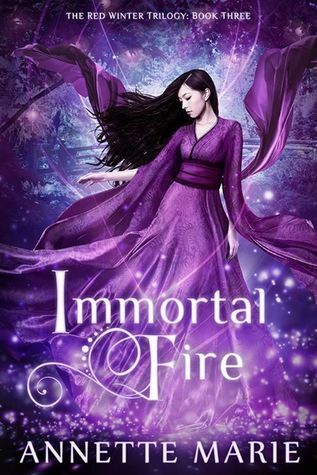 Seriously, have you seen how absolutely gorgeous these covers are? Wouldn’t they look amazing on your bookshelf? Have you read Red Winter? Or is it on your TBR? Does it sound like something you’d enjoy? Also, How tired are you of me raving about this series? 😉 And what’s one hidden gem book you can’t stop raving about yourself? I loved this series but I wan’t surprised because Annette Marie other series was just as good. But yeah it taking place in a Japanese mythological surronding is quite a nice and unique touch. This series sounds amazing. 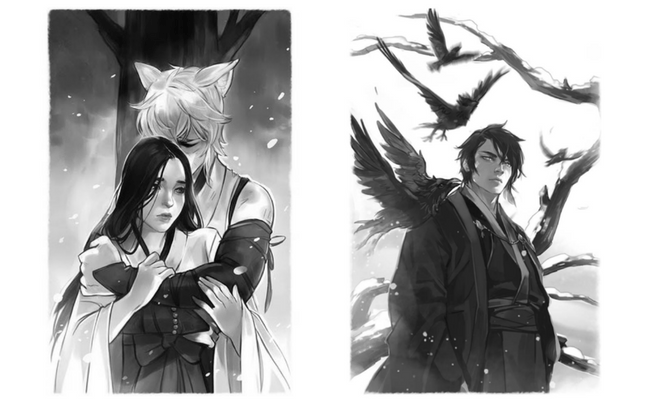 Exactly my sort of thing <3 The illustrations, the characters!! Okay, I am absolutely sold on this series. Excuse me while I go away and buy it straight away! I love your spin on this weeks theme. I have not heard of this series, but it definitely looks interesting. Katie @Just Another Girl and Her Books recently posted…*Top Ten Tuesday* Ten Hidden Gems in Children’s Books. Thanks so much 🙂 Glad it seems interesting! The Red Winter trilogy covers are sooo beautiful! I need to check out that series. Thanks for the recs!! They are some gorgeous covers indeed 🙂 Hope you’ll enjoy this series when you check it out! Ooh it’s always cool to discover a series that a blogger is passionate about! 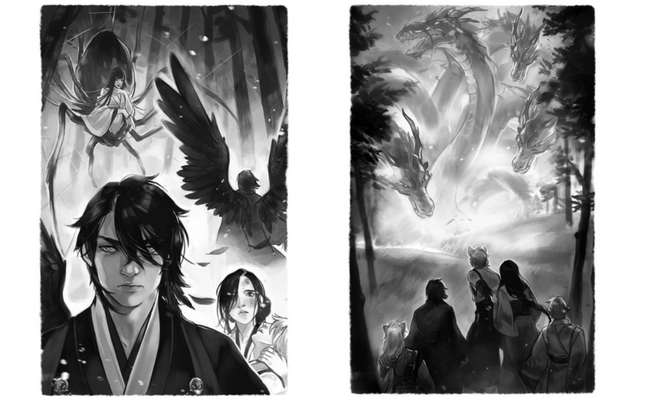 I love the sound of the Japanese mythology, we need more of that. And the illustrations look great too. I love that one with the dragon heads! Have you read the Wayward graphic novels? Those deal with Japanese myth too. Haha yeah I’m definitely passionate about this series 🙂 I hadn’t heard about the Wayward graphic novels yet, but I’ll check it out so thanks so much for the rec! Hi! I’m the same way. Most of what I read is from a long list of books I need to read to keep up with all the talk! 🙂 I love to find lesser-known books, though. I just need to seek them out more! Nice twist on this week’s topic and you’ve just made me want to start this series even more than I already did! Glad to hear I’m not the only one who doesn’t take many risks on hidden gems 🙂 But I do hope you’ll enjoy Red Winter, even if it’s unlike your usual reads! AH that makes me so happy 😀 Hope you’ll enjoy! This is a lovely spin on this week’s topic, Lindsey! I love how you changed it up. I’ve not read this series, but I should give it a closer look because it LOOKS lovely. It’s just that I don’t think I’ve really READ much about it aside from seeing it on some lists, etc. Thanks, as always, for visiting Finding Wonderland. Thanks, Rissi! I definitely hope you’ll enjoy it if you decide to pick it up! Okay, I have so much catching up to do on your blog since I basically haven’t been present all of this month! But I had to just stop in on this one post specifically before I collapse into my bed for the night. 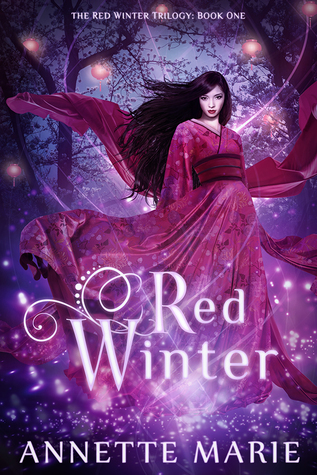 You know how much I love Red Winter too and I am so glad you showcase it whenever you can! That’s awesome. And I’m definitely not sick of you raving about it, nor am a tired of raving about it myself. Everyone should read this series! Lovely post and I’ll catch up on your blog soooooooon! Di!!! I’m so happy to see you (well, read you, haha)! Hope everything’s ok! I completely agree! I was absolutely blown away by this series; it’s uniqueness, vibrancy, pace, characters, plot development… everything! Emi is also one of my favourite heroines too. It was a relief to meet a gal whose strength of character was matched by kindness, bravery and honesty. I’m getting sick of the chic protagonists who can do everything, are probably orphans, and are badass with a knife or bow and arrow. Give me someone real, hey! If you’re looking for a hidden gem in the YA paranormal genre… try the E.E Holmes’ The Gateway Trilogy and the Gateway Trackers series. Again, slow moving at the start, but persevere! Incredible world-building, such likeable characters, and a thrilling plot development. Also, Katherine Arden’s Winternight Trilogy is packed full of Russian mythology, fable and history and is simply WONDERFUL! !